Are the Pyramids Made out of Concrete? Watch a FREE video conference “Building the Pyramids of Egypt with Fake Stones” by Joseph Davidovits, duration 1 hour 20 minutes. Paleomagnetism study supports the man-made stone concept. Go to Paleomagnetism study. The Pyramids at Giza have more than 5 million blocks of limestone, until now believed to be CARVED stones, new evidences shows they were CAST with agglomerated limestone concrete. The website reveals how Ancient Egyptians built the pyramids using man-made stones, which look exactly like natural rocks. The limestone blocks were cast in situ, employing an advanced technology that was later lost, leaving a puzzle hidden for thousands of years inside the pyramid stones. This theory undoubtedly shed an amazing new light on what really happened in Egypt in that remote era. HIGH PRIEST IMHOTEP INVENTED THE CHEMICAL FORMULA 5000 YEARS AGO. Prof. JOSEPH DAVIDOVITS , scientist, REDISCOVERS ANCIENT EGYPTIAN ARI-KAT TECHNOLOGY. A twelve-tonne replica of a pyramid limestone block was cast at the GEOPOLYMER INSTITUTE in Saint Quentin, France. In this section: CG pictures, some pictures and texts after Relevant Television. 3D recreation of carved stones hauled using ramps. Generations of school children the world over have been asked to imagine vast teams of Egyptian workers carving the stones, hauling them to the site of the pyramid and hoisting them up until each one was placed in its exact position. But, how could this have been done? The Great Pyramid of Kheops is comprised of about 2.5 million blocks, most weigh two tons and could have been hauled by no less than sixty men. But some weigh up to seventy tons and these are to be found, not at the base of the pyramid, but some forty meters high. Since the ancient Egyptians did not yet have the wheel, they would have needed more than two thousand men to haul each block. How could this pyramid have been erected in the 20-year reign of Pharaoh Kheops? To accomplish the task, at least 400 blocks per day would have had to be put in position as from the first day of the pharaoh’s accession to the throne. Hundreds of thousands of men would have been working simultaneously – squeezed shoulder to shoulder in the space of a single block in a modern city. But this would not been feasible. In such conditions the men would not have been able to budge. How could the Ancient Egyptians have cut these stones, which are extremely hard, with only the most primitive of tools?. At best they would have been able to use copper saws, and copper is a softish metal, incapable of hewing the hard limestone blocks from which the early pyramids are constructed. How was it possible to transport the large stones when the wheel had not yet been invented and there were no pulleys to hoist them into the air? If the stones were carved, as most people believe, where are the fragments of broken stone left over ? Limestone frequently splits on being cut. 5 million tons of limestone blocks must have produced millions of broken blocks and fragments. Yet, not a trace of them has ever been found. How could a civilization without hard metals have carved the millions of blocks of the Great Pyramid to ten different and exactly-calculated lengths in order to set them in patterns throughout the whole structure to eliminate the formation of vertical joints? How could these joints between adjacent blocks be achieved so perfectly? The joints between millions of blocks, vertically and horizontally are not more that 2 mm wide. How were the blocks cut and leveled without motor-driven machinery or diamond drills? The answer has at last been found, and it totally contradicts the stone-carving theories. The pyramids were cast in situ. Curiously enough, that explanation had been there always, waiting to be discovered by examining the mysterious stones from which the pyramids were built. Since the early eighties, Prof. Joseph Davidovits is proposing that the pyramids and temples of Old Kingdom Egypt were constructed using agglomerated limestone, rather than quarried and hoisted blocks of natural limestone. This type of fossil-shell limestone concrete would have been cast or packed into molds. Egyptian workmen went to outcrops of relatively soft limestone, disaggregated it with water, then mixed the muddy limestone (including the fossil-shells) with lime and tecto-alumino-silicate-forming materials (geosynthesis) such as kaolin clay, silt, and the Egyptian salt natron (sodium carbonate). The limestone mud was carried up by the bucketful and then poured, packed or rammed into molds (made of wood, stone, clay or brick) placed on the pyramid sides. This re-agglomerated limestone, bonded by geochemical reaction (called geopolymer cement), thus hardened into resistant blocks. In 1979, at the second International Congress of Egyptologists, Grenoble, France, he presented two conferences. One set forth the hypothesis that the pyramid blocks were cast as concrete, instead of carved. Such a theory was greatly disruptive to the orthodox theory with its hundreds of thousand of workers taking part in this gigantic endeavor. The second conference stressed that ancient stone vases manufactured 5000 years ago by Egyptians artists were made of cast synthetic (man made) hard stone. J. Davidovits’ research was fiercely opposed by some experts (geologists and egyptologists) who did not refrain from publicizing the usual brickbats. The theory was finally published in a popular book, in 1989, entitled: “The Pyramids: an enigma solved”, Hippocrene Books, New York (4 printings) and later by Dorset, New York. 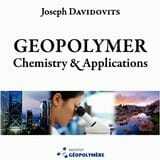 In 1998, Prof. Davidovits resumed his work and he has presented updated and new results at Geopolymer Congresses. (See details in Archaeology applications in Geopolymer Proceedings ). Also, revised editions of the book has been published since 2003, see They built the Pyramids and also the books published in different languages at J. Davidovits website. The carving and hoisting theory indeed raises questions that have been insufficiently answered. Using stone and copper tools, how did workers manage to make the pyramid faces absolutely flat? How did they make the faces meet at a perfect point at the summit? How did they make the tiers so level? How could the required amount of workers maneuver on the building site? How did they make the blocks so uniform? How were some of the heaviest blocks in the pyramid placed at great heights? How were twenty-two acres of casing blocks all made to fit to a hair’s breadth and closer? How was all of the work done in about twenty years? Experts can only guess. And Egyptologists must admit that the problems have not been resolved. Imhotep designed and built the first pyramid in human history, the Step Pyramid at Saqqara, the first manifestation of higher knowledge in ancient Egypt. He belonged to a closed organization of priests called the School of Mysteries of “The Eye of Horus”, exclusive guardians of knowledge in ancient Egypt. Imhotep, whose name means “The sage who comes in peace”, occupies one of the most distinguished places in history. He was revered in Egypt for three thousand years – that is, from his own lifetime during the reign of King Djoser right up to the Greek and Roman conquests of Egypt. His father was the royal architect Kanofer, his mother Khreduonkh, an hereditary noble. At a very early age, Imhotep entered the priesthood and began to live at the Temple of Annu on the shores of the Nile – a center of science and religion, with a great library, were Imhotep learned how to read and write in the symbolic language of hieroglyphs. Imhotep casting a limestone block. Imhotep left plans with temple designs that were built thousands of years after his death, as stated in the hieroglyphs of several temples. He was a geometer, doctor of medicine, inventor of the Caduceus, the present-day symbol of physicians. The legend says Imhotep devised the way to divide the heavens into 30º sectors, known today as the Zodiacal eras, to record the movements of the stars and constellations. A priest-scientist like Imhotep, who could make stone vessels, enjoyed a special status, since his knowledge enabled him to give form to stones, and stone for the Egyptians was the symbol of the Eternal. After his death he was deified by the Egyptians who identified him with Thoth the Ibis-faced divinity of wisdom. The Gnostics called him Hermes Trismegistus, the Thrice Great, founder and origin of their esoteric wisdom. At the Geopolymer Institute in St Quentin near Paris, Dr Joseph Davidovits researches ancient cements and new concretes, new ceramics and binders for high tech industries. He is renowned for his research into a branch of chemistry whose chief study is geopolymers – a mineral inorganic polymer based on silicium and aluminum geological molecules. Throughout his long professional life, Professor Davidovits has taught in US universities, has published three important studies on the pyramids and has patented a number of original products that employ sophisticated processes in the manufacture of cement, ceramic and binder. In 1998, he was awarded France’s “Chevalier de L’Ordre National du Mérite” in recognition of his research and of his many patents in an innovative branch of chemistry known as geopolymerization. Finally, he is a member of the International Association of Egyptologists and is regularly presenting his archaeological works during international congresses in egyptology since 1979. Dr. Davidovits creates new mineral compounds and rocks by copying and accelerating natural processes. He is the author of the books “Ils ont bâti les Pyramides”, Paris 2002, “La nouvelle histoire des Pyramides”, Paris 2004 (2nd ed. 2006) and “The pyramids: an enigma solved”, New York, 1988. His most recent book in English is Why the pharaohs built the Pyramids with fake stones. He has taken a special interest in the Egyptian pyramids and has combined a new approach – a chemist’s approach – to hieroglyph interpretation, with in-depth research on the structure and composition of the stone blocks and cements used in pyramid-building. As a result, and after long experimentation in the casting and molding of stone, he has published a fascinating theory about how the construction of these giant man-made mountains must have been carried out.